Delhivery: Know how a group of friends stood a business of worth INR 500+ crores? Home > Blog > Blog > Delhivery: Know how a group of friends stood a business of worth INR 500+ crores? The journey of Delhivery started in the year 2011when Sahil Barua and Mohit Tandon left their consulting jobs at Bain & Company to start this e-commerce venture. They observed the urgent need of managed logistics in e-commerce Company and finally grabbed the space significantly. The initial idea behind setting up Delhivery was to provide a simpler solution of logistics for the e-commerce world. 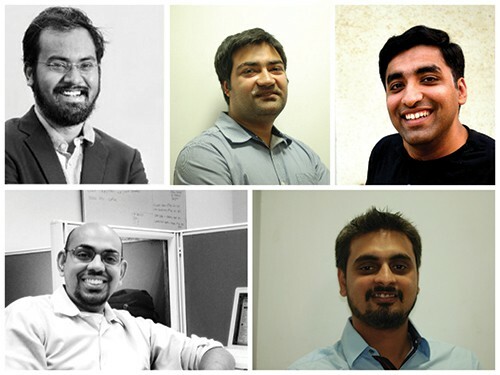 Later both the founders were joined by their 3 more partners Suraj Saharan, Bhavesh Manglani, and Kapil Bharati. Delhivery is an e-commerce fulfillment logistic company started in Gurgaon in the month of June 2011. The company was founded by 5 members and currently it has grown up in the flourished logistics empire with three verticals. First one is fulfillment (warehousing and packaging); second one is Omni-channel (technology services to online retailers); and third one is data services (route optimization and real-time shipment tracking). The fulfillment services are currently available in metros like Delhi, Gurgaon, Mumbai, Chennai, Hyderabad, Bangalore and many other small cities. The initial challenge for them was to start their business and make tie up with the large e-commerce ventures to complete the e-commerce chain. There were many companies in the same industry but Delhivery came far ahead in the field. Today, the firm serves over 200 offline retailers, 25,000 sellers and 800 e-commerce companies in around 175 cities with a transaction of 90000 products per day. The company was founded in May and launched express logistics services in Delhi NCR in June. The company reached to the stage of delivering 500+ shipments per day for 5 e-commerce clients in Delhi NCR till the end of December with a total team size of 150+ employees. The most awaited moment for any company came for Delhivery too in the month of April. The company raised its Series A round of funding from Times Internet Limited. The company also launched fulfillment services in Delhi and Chennai with 10,000+ sq. ft. of fulfillment space. At the end of year 2012, the company processed upto 50,000 shipments a month delivering upto 9,000 shipments a day. The cross mark was touched with the continuous effort of 1,000+ team members. The company expanded Express logistics services to 130+ cities. Also the fulfillment services expanded to 3 cities with 40,000+ sq. ft. of fulfillment space. Again the enjoyment time came for the company and it received $6 million in Series B round of funding in Septemberfrom Times Internet Limited and Nexus Venture Partners. The company also launched suite of commerce technology including Vendor Panel, Godam, and FALCON. All this was the joint effort of 2500+ team employees. Express logistics service was expanded to 175+ cities in India, Middle-East and South-Asia. Other than that, 12 more fulfillment centers were expanded to offer Delhivery fulfillment services across India (over 0.5 million sq. ft. of space). The processing capacity was also expanded to over 250000 shipments per day. Once again the happy moment arrived for the team. This time it was Series C round of funding which was led by two returning investors witha new investor. In September, the company raised $35 million of funding for its development and marketing. The team size grew to 5,000+ till the end of the year. The company claims that “Partnering with them will give other companies a new height.Delhivery is offering services in over 175 cities across Indiawhich will increase in the coming time. The infrastructure is equipped to handle over 90,000 transactions per day and 150000 SKUs. The company calls other e-commerce ventures to join hand with in the fulfillment of the express logistics needs across India. At present, the company has an expanding network of over 25,000 sellers. The firm has raised a total of $127.5 million in 4 round of funding from 5 different investors. Total revenue for the year 2014 was noted to be Rs 62 crores which is expected to reach at Rs 800 crores by the year 2017. First round of funding came in early stage in which Times Internet came forward to invest with the venture and raised $1.5 million on August 1, 2012. Again after 1 year from the round one of funding, the same investor along with Nexus Venture Partners approached and invested $6 million on September 30, 2013 in Series B round of funding. Repeating the culture of funding, both the previous investors returned back with a third investor Multiple Alternate Asset Management, who invested a huge amount of $35 million in Series C round of funding on September 8, 2014. Soon after, the company got a funding of $85 million in Series D round of funding from the returned 3 investors along with Tiger Global Management. This funding was recently raised by the company on May 6, 2015. Initially, the founders were lacking in money but somehow they bootstrapped the company with their own money. Barua stated “initial two round of funding have helped us to understand our customers better”. In June 2013, Delhivery had acquired the cash collection services company, Gharpay Technology Services Pvt Ltd. At that stage, it was present across 10 cities with 60 field staff. Barua added on the acquisition, “For us, the integration process was simple because, by then, we were present in over 40 cities with more than 1000 employees on board”. 1) 186% Rise in Entrepreneurship! Thanks to Affordable Digital Advertising! What differentiated Delhivery with its Competitors? Barua thinks about two aspects that differentiate Delhivery from other players like Dotzot Express and Ecom Express. Firstly, he claims Delhivery to be a specialized play-actor in the logistics industry and, unlike older players; it does not operate on a widely distributed franchise model, which often leads to difficulties in standardization and control. “Our focus when building the company was never to blindly create a ground network of delivery staff, but to invest heavily in technology, training and process engineering. This helped us scale faster and sustain growth over the last four years, where most new players have disappeared,” said Barua. He furtherelucidates that, in fact, Delhivery is not merely an express logistics company but an e-commerce fulfillment company. Delhivery has built multiple revenue models to suit the requirements of each client. For instance, its fulfillment and express shipping services are provided to merchants on a per shipment basis, to ensure that merchants of all sizes work with it. In the coming years, Barua and his team plan to take Delhivery to an international level such as in China, Singapore and Sri Lanka. At the same time he clarified that the company will focus on commerce technology and fulfillment services in international markets rather than to invest in building express logistics services. Moreover, in four years, Delhivery plans to tap 1,000 offline and one-lakh small retailers, and, in five years, aspires to be the largest retail ecosystem enabler in India. “Think of us as an emerging eBay enterprise + FedEx of India,” Barua said with laughter on a parting note.